When we think of headwinds, we think of sailing into the storm, wind whipping our faces, making slow and halting progress against forces beyond our control. Headwinds is a good word for the market forces facing membership organizations today. They come in many forms: free and easy access to content that was once exclusive to associations, ever-increasing demands for exceptional customer experiences that associations can never quite live up to, and a growing preference among professionals to build and nurture their own professional networks. These headwinds have been building for some time, and the effects are now rippling through the association world – lowering advertising, royalty, and other revenue sources along with it. They have made themselves plain in the dashboard metrics of most membership organizations. Membership and revenue have been trending down in most large associations. Faced with these inexorable realities, organizations have chosen a wide range of responses, from incremental and defensive to bold and innovative. Embracing the mission. The mission is the advantage for many associations because it provides an emotional rallying point for members that cannot be replicated by others. In an economy marked with stagnant wages, encroachment from lower paid, less qualified workers, and declining public and private investment in R&D, redoubling advocacy efforts in support of a profession and its professionals goes a long way to acquiring and retaining members. Tightening the focus. Organizations that can focus on narrowly defined audiences or issues are better able to ride the currents of market forces by building uniquely valuable products, content, and experiences. Large associations with diverse memberships often struggle to meet the needs of their varied member segments. Smaller organizations have the advantage that their missions allow them to focus with laser-like precision on spaces where they can concentrate their resources and fend off competition. Going for groups. Unlike the bland group discounts offered in the past, newer programs layer on innovative B2B benefits with calculable ROI for the employer as well as intangible benefits important to decision-making executives. For example, benefits may provide greater access and influence within the association as well as publicity and recognition for their involvement. This approach provides great value to both parties at no cost to the association. Early successes imply these programs may soon surpass individual membership in importance. Expanding overseas. A trend spearheaded by associations who lack room for additional domestic growth is to turn to international markets for new audiences. US-based organizations often have big advantages in terms of intellectual property and access to American networks and resources. Overseas membership models are often less mature and competition less intense. These new markets not only bring additional members, but new content creators, subscribers, and event attendees as well. Diversify revenue. Organizations that can leverage their unique assets, such as data and other intellectual property, have become, in effect, publishers, and often quite successful ones. Dependent on members for neither revenue nor assets, their relationships with individuals are as customers for their content, most often mediated by the corporate and academic institutions which buy it. Such organizations have created the luxury for themselves of radically rethinking, even to the point of abridging, their membership model to focus their investments on riding the winds of change instead. Efforts at reinvention sometimes fail, triggering new rounds of soul-searching and re-engineering. In most cases, these initiatives were rationally sound, but missed the mark in terms of what members uniquely want from an association. Organizations that create fulfilling experiences of belonging, meaning, connection, and identity thrive. Organizations grounded in “transaction value” tend to fall flat. Sweetening the offer may not be sweet enough. After years of wrestling with the value-for-dues equation, some organizations have repackaged and bundled their membership offerings, coupled with steep dues discounts. Yet price is only one part of the equation. One prominent professional association that adopted this strategy netted no real member growth while losing millions of dollars in dues revenue. The mistake was not recognizing the confluence of external forces confronting the membership model and the personal connection to the mission that only the association can provide. Discounts don’t do it anymore. Many associations have a legacy of offering member discounts through royalty arrangements and affinity programs. Faced with the new market realities of hyper-targeted marketing and an on-demand economy, these programs do little to attract or retain members and the revenue they generate is in quick decline. Some work hard to add more discounts and attract more desirable brands to their programs. Members don’t need their association to connect them to discounts and businesses don’t need to pay an association to find its customers anymore. A more productive course is to trim commercial benefits to a few unique, signature offers that tie closely to the core mission and offer real value to the members, revenue notwithstanding. The pace of change is accelerating, not only in velocity, but in the sheer number of fundamental shifts and unforeseen threats. It is often not one new development but rather a nexus of powerful but fragmented changes that overwhelm old ways of doing business and create entry points for new competitors. Yet headwinds are an opportunity to pull ahead for those who know how to tack into them while others struggle to stay even. The most successful organizations have seized the moment to consider their options and turn threats into opportunities. 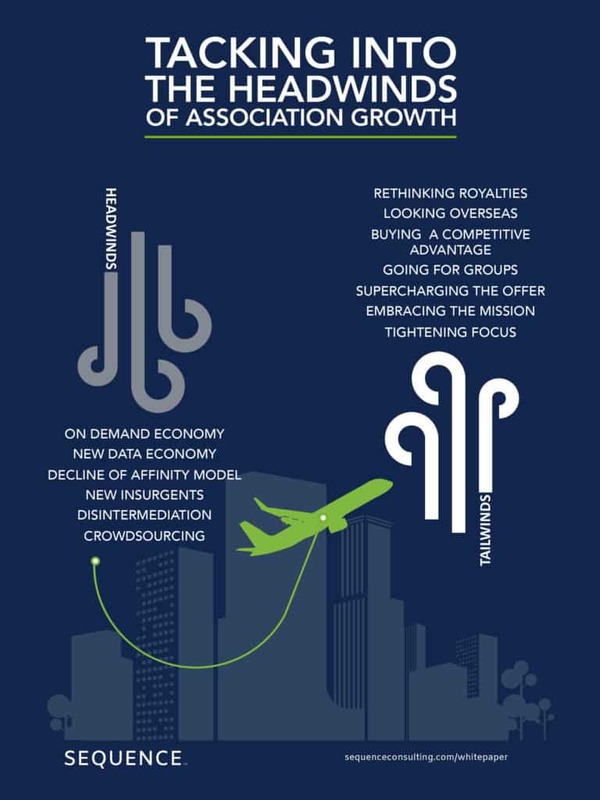 To learn more about these market trends and how leading associations are responding, we invite you to download our full white paper analysis, Tacking into the Headwinds of Association Growth.